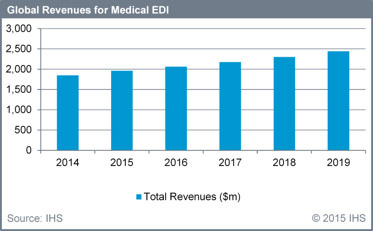 Worldwide revenues for medical electronic data interchange (EDI) is expected to increase to over $2.4 billion in 2019, up from $1.8 billion in 2014, according to IHS Inc., the leading global source of critical information and insight. According to a new market research report, the “Healthcare EDI Market by Component (EDI Software, EDI Services), by Transactions (Claim Status, Eligibility Verification) by Mode of Delivery (Web-based EDI, Mobile EDI, EDI Van) by End-users (Healthcare Payers, Providers) – Global Forecast to 2018, published by MarketsandMarkets, the global healthcare EDI market is expected to grow at a CAGR of 13.7% in the forecast period to reach $1,681.1 million by 2018. In 1995, M2 Systems announced its first commercially available healthcare payer solution, Clearinghouse/2000. Working with a focus group of Blue Cross Blue Shield (BCBS) plans, M2 and BCBS member plans collaborated on the next generation of best-practices, concentrating on upcoming governmental regulations governing patient privacy and information security. The Health Insurance Portability and Accountability Act, or HIPAA, was born in 1996. This consortium of health plans guided M2 through the process of developing and delivering the first production implementation of HIPAA in the industry. M2 understands the complexities pervasive in this rapidly changing and ever evolving industry. That’s why M2 solutions leverage the strength of EDI and e-commerce standards to deliver robust, real-time and batch solutions that securely connect, manage, transform, route and track healthcare transactions for some of the most highly respected healthcare organizations. healthENGIN was designed by these experts to encompass the proven capabilities of ENGIN© with the industry’s first commercially available HIPAA-compliant all-payer solution. healthENGIN is ready for your most complex healthcare IT challenges and is the proven technology used by the nation’s largest payers, currently processing 70% of Medicare Part A/B claims and 100% of national Durable Medical Equipment (DME) claims. healthENGIN is running 58% of CMS MAC jurisdictions and processing hundreds of millions of claims annually. Architected to scale up or scale down, healthENGIN addresses all tiers of the health payer market, from private commercial to government sponsored. healthENGIN is flexible and affordable to plans of all sizes, with no per-claim or transaction charge. Since 1995, when M2 announced and delivered our first clearinghouse solution, Clearinghouse/2000, we have continued to deliver and improve our solutions for the healthcare claims processing market. Today, healthENGIN represents M2’s commitment to our clients and this industry. Private-sector commercial plans and Medicare Administrative Contractors (MAC) depend on healthENGIN for their critical claims processing requirements. M2 solutions ensure our clients meet the demanding and ever changing requirements of the Centers for Medicare and Medicaid Services (CMS). Payers and providers alike can trust M2 and healthENGIN to meet and exceed governmental mandates for compliance, auditing, reporting and transaction security. Through partnership with the Healthcare Data Interchange Group (HDIG), a consortium of 7 Blue Cross Blue Shield organizations, M2 has helped to establish a set of best practices that encapsulate HIPAA certifiable administrative transactions. These best practices have been directly incorporated into M2’s healthENGIN, allowing members to move quickly through the 5010 HIPAA implementation, testing and production environments. One of M2’s clients became the first Medicare intermediary in the country to put the HIPAA-compliant ANSI X.12 837 Institutional Format into production. New channels such as Internet of Things (IoT), mobile and demand personalization are within reach with healthENGIN. User access to critical data for provisioning, customer support and trading partner management is simplified with healthENGIN’s Provider Portal. Since 1986, M2 Systems has successfully delivered integration and transaction delivery solutions to a multitude of industries, including the healthcare provider market. Many of the world’s well-known companies rely on M2 for their integration needs. Real-time, high-volume, business-critical companies use M2 for high-performance, high-reliability computing. Your company can rely on M2 as well for any-to-any data and message translation. Healthcare providers have depended on M2 ENGIN as the foundation for their healthcare delivery networks. Regardless of your enterprise EHR vendor, healthENGIN can make communicating and transacting with internal and external systems seamless. The healthcare integration market is expected to grow at a CAGR of 9.6%, and to reach $2,745.9 million by 2018 from $1,737.3 million in 2013, according to worldwide industry research leader MarketsandMarkets. Managing industry and government standards is especially important within the healthcare industry. With M2’s extensive library of standards for ANSI X.12, our clients possess the technology tools and business expertise to provision and certify interfaces and message formats. Our unique and superior translation capabilities allow you to easily and efficiently deploy, test, certify and deliver EDI transactions. Single-pass translation means edits and transformations are done quickly and error-free. M2 healthENGIN supports both real-time and batch formats for claims processing environments. As new standards and revisions become available, let M2 take care of your compliance requirements. We were the first healthcare IT vendor to deliver HIPAA 5010 compliant solutions. NSF, UB-92 and NCPDP formats are also available with healthENGIN. Proprietary formats can be easily provisioned within our Data Services modules.